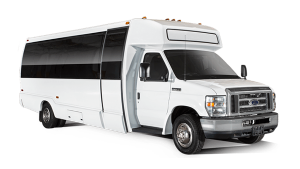 With slightly more space than its 18-passenger counterpart, the 20-passenger minibus is great for medium-sized groups in need of transportation on a day trip or a night out. Sit back and relax while one of our experienced drivers navigates your group to every stop on your itinerary. Total Charters services areas across the Midwest, making it easy to travel to all of your top destinations in Chicago, Detroit, Indianapolis, Louisville, St. Louis, and more. With experience in servicing events of all types, we’re your #1 choice for all of your Midwestern group travel. Trust us for comfortable bus transportation to business trips, field trips, family events, and more. We’re available 24/7 at 1-866-303-2594 to help you plan your perfect trip!